For the wellbeing of everyone we work with. Our employees are our greatest assets and we do everything we possibly can to ensure their wellbeing, health and safety. Most of them work on building sites around the world and every day, they give their all by braving the heights, the cold, the heat and wind and rain. Therefore, it is absolutely imperative to work towards our target of zero incidents and accidents. In order to achieve that we focus on creating a safety culture at KAEFER. 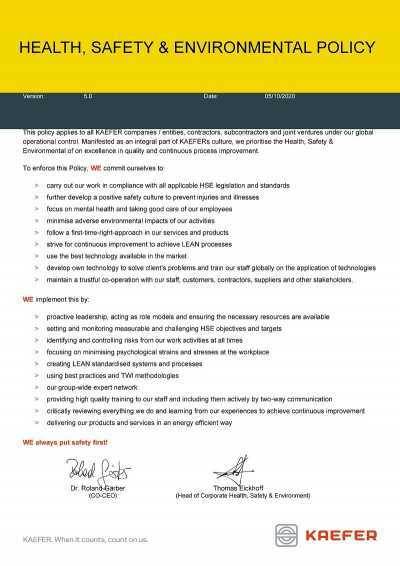 Only if all the members of our organisation are committed to and aware of the importance of health and safety can we make a sustainable difference. 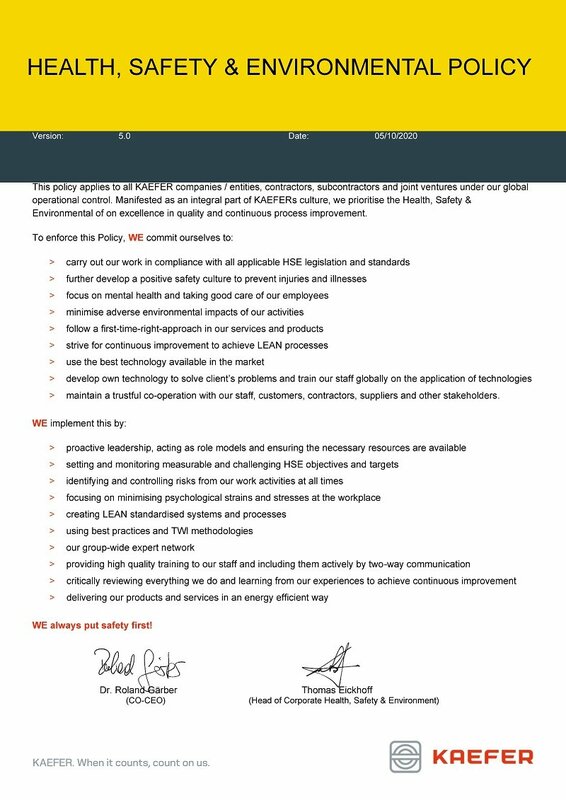 From education and training to risk assessment and safety awards, all our measures contribute to positive and measurable results for everyone – from the management board to the workers on the construction sites. Incidents and accidents can happen, of course. It’s about ensuring they don't happen again. That's why we take the investigation and analysis of work-related incidents very seriously and make it an essential part of managing health and safety at KAEFER. And when it comes to dealing with the removal and containment of asbestos containing materials (ACM), we don’t just apply high standards – we exceed them. From erecting enclosures and the removal of asbestos insulation to the sampling, repair and encapsulation of ACM and transfer of waste to disposal facilities, KAEFER is one of the few companies to offer these services to both industrial and public sector clients. Safety standards set the parameters within which we operate. And they also set the bar with which we measure our performance. Therefore, reporting is an important factor. Because you cannot resolve an issue if you don’t know it exists. Only if we act upon issues today can we make a difference for tomorrow. It may sound obvious, but health and safety is a prerequisite in our business. For us and for our clients. That’s why we actively involve them in all aspects of our safety culture and welcome a mutual exchange of ideas and concepts on how to ensure we reach the target of zero accidents and incidents.